Guilloneau et al. (119) compared 12 patients undergoing laparoscopic partial nephrec-tomy with renal hilar clamping versus 16 patients undergoing laparoscopic partial nephrectomy without hilar control. The non-clamping group experienced significantly greater blood loss (708 vs. 270 mL; p = 0.014) and longer operative time (3 vs. 2 hours; p = 0.004) compared to laparoscopic partial nephrectomy with hilar clamping. Postoperative serum creatinine levels were not significantly different (1.3 vs. 1.45 mg/dL, respectively; p = 0.08) between groups. In another study, Kane et al. 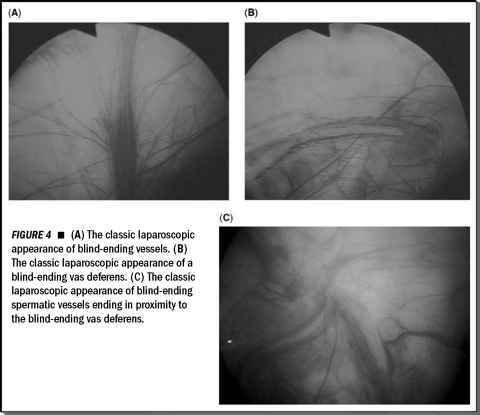 (120) compared 15 patients undergoing laparoscopic partial nephrectomy with arterial occlusion with 12 patients undergoing laparoscopic partial nephrectomy without arterial occlusion. A nonsignificant 10% postoperative increase of serum creatinine from preoper-ative baseline levels was observed in each group. Postoperative renal failure did not develop in any patient, and hemodialysis was not required. In nine patients, postoperative technetium-99 mercaptoacetyl triglycine renal scan revealed near equal split (49% vs. 51%) of postoperative renal function reflecting minimal impact of mean warm ischemia time of 43 minutes (range, 25-65). The authors concluded that temporary artery occlusion had no measurable negative effect on renal function.